Jason Cornelius is a graduate student and National Science Foundation (NSF) Fellow at the Pennsylvania State University, where he carries out research in computational fluid dynamics (CFD) for the Dragonfly aircraft. Jason found his start in vertical flight while studying the fundamentals with the Penn State Vertical Lift Research Center of Excellence. As an undergraduate, Jason attended the Penn State Rotary Wing Short Course, which solidified his passion for rotorcraft engineering. He then interned at Bell for two summers, accumulating knowledge in rotor finite element analysis, flight technology research, preliminary vehicle design, CFD analysis, wind tunnel experimentation and helicopter certification. Jason is now in the Pathways program at the NASA Ames Research Center's Rotorcraft Aeromechanics Branch, where he has studied multi-rotor acoustics and ran CFD simulations on the parachute for the Mars 2020 mission. 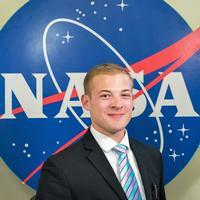 His current research analyzes the Dragonfly coaxial quadcopter aircraft set to explore Titan, one of Saturn’s moon. “[This] work will provide insight into the design of the vehicle’s four co-axial rotors and fuselage, improve the knowledge base of multi-rotor performance, and provide a high-fidelity tool to analyze future configurations,” explained Jason. Jason has also been actively engaged outside of his studies at Penn State. He has served as Vice President for the Penn State chapter of the Vertical Flight Society, and Vice President of the Wind Energy Club that has been successful in US Department of Energy Collegiate Wind Competitions. In addition to his involvement with the Penn State student chapter, Jason credits the many VFS members he has worked with: "I have also been fortunate to encounter many great mentors within the field. I would like to thank Drs. Edward Smith, Sven Schmitz, William Warmbrodt, Albert Brand, Michael Kinzel, and Natasha Schatzman for their support and guidance throughout the years.